Heat oven to 425°F. Spray cookie sheet with cooking spray; sprinkle with cornmeal. Unroll dough; place on cookie sheet. Starting at center, press out dough into 14x12-inch rectangle. Brush dough with olive oil. Bake 6 to 8 minutes. Sprinkle Cheddar cheese in the shape of a "plus sign" on crust, dividing the crust into four squares. Top each square with 1 of the 4 variations listed above to make 4 different squares; if desired, on the Pepperoni Pizza Square, arrange the pepperoni to make a happy face. Top entire pizza with mozzarella cheese. Bake 10 to 13 minutes longer or until crust is deep golden brown and cheese is melted and bubbly. Cut pizza into 4 squares; cut each square into 4 squares to make a total of 16 squares. This recipe lends itself well to other variations. 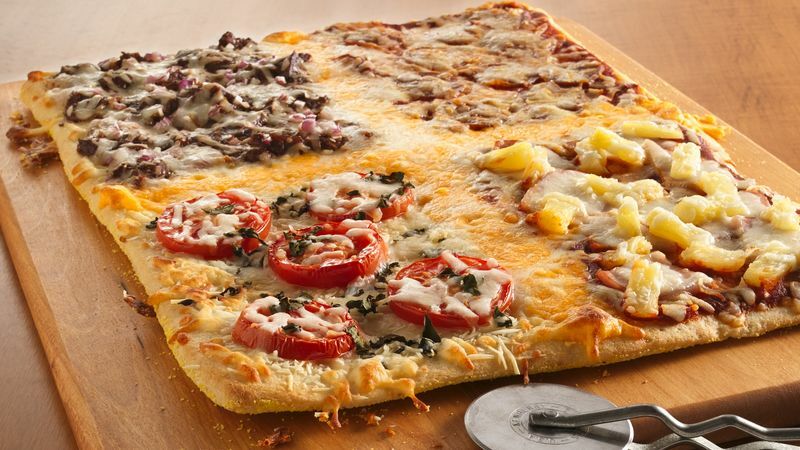 Get creative and add your family's favorite toppings! For a perfect party pizza, follow Steps 1 and 2, dividing the crust into four squares with lines of shredded Cheddar cheese as described. Then provide toppings (meats, cheeses, sauces, fruits, etc. ), allowing guests to complete a square with the ingredients of their choice. Wonderful for a teen sleepover party! Kid-friendly tip: An egg slicer makes a safe knife alternative for cutting mushrooms, tomatoes and other small veggies. Get more tips for kid-safe cooking.